Stella: [to the camera] That's Mr. Winfield. Vice President of our first National Bank, Chairman of the Civic Betterment League, and twice winner of the Elks picnic potato sack race. 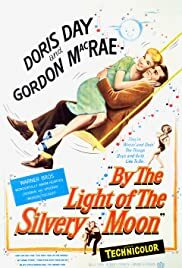 BY THE LIGHT OF THE SILVERY MOON is a continuation of "On Moonlight Bay", the previous flick featuring DORIS DAY and GORDON MacRAE as sweethearts during the early 1900s who get to croon some pretty wonderful songs of that period. It's strictly family stuff, nostalgic and as prettily pictured as a postcard of an Americana that never really existed except in Hollywood's imagination and Norman Rockwell paintings. The delightful supporting cast has LEON AMES (who was also Judy Garland's father in MEET ME IN ST. LOUIS), MARY WICKE (as the sharp-tongued housekeeper), ROSEMARY DeCAMP as the patient wife and RUSSELL ARMS as Doris' nerdy other love. The wholesome story (from a Booth Tarkington tale) has Doris' bratty brother letting his childish imagination running away from him when he suspects his father is having an affair with a French actress. The skating ring sequence closes the story on a happy note--and after a nice bunch of songs by Day and MacRae (including "Be My Little Baby Bumble-Bee", "If You Were the Only Girl in the World" and "By the Light of the Silvery Moon"), you'll feel yourself back in those innocent times wishing life could imitate the movies.